Florence Corporation has focused on providing superior quality mailboxes and accessories for centralized distribution and collection of mail and packages since 1934. This laser-like focus means Florence has the most extensive industry knowledge and has grown its product lines to provide the best solutions for design professionals and postal Florence tag on the corner of mailbox officials throughout ever changing times. 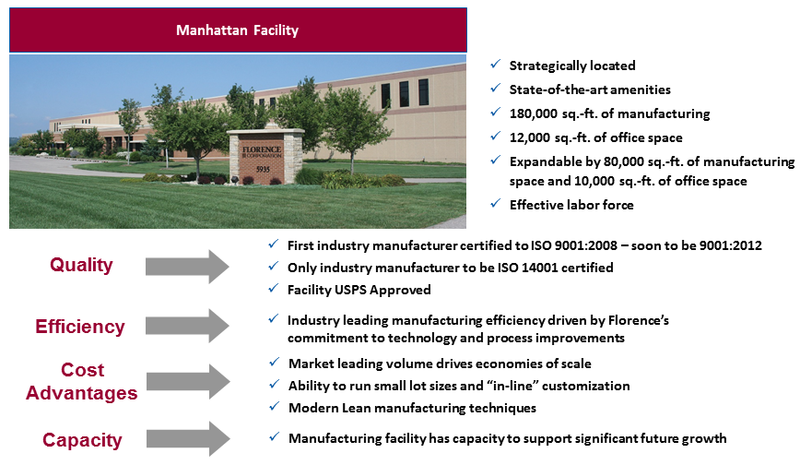 With a centrally located facility in Manhattan, Kansas, Florence is proud to be the only mailbox manufacturer who is both an ISO 9001:2008 and ISO 14001:2004 Underwriters Laboratory audited manufacturer. Florence Corporation is dedicated to environmental stewardship by maintaining a successful recycling program which ensures appropriate re-use and/or reprocessing of all aluminum, corrugate, powder paint, wood, and steel materials as well as office waste. This vertically integrated plant featuring on-site fabrication, state-of-the-art self-contained powder coating, and robotic welding has also been presented with a Pollution Prevention Award and is an OSHA certified SHARP facility. The Florence line of postal specialties has maintained industry leadership for decades by offering consistently superior product quality and rapid, reliable customer service - even after the sale. We provide technical support and customer service through both our centralized customer service operation and network of sales and manufacturer's representatives. Florence is also proud to have built relationships with the most extensive national dealer network in the industry. Authorized Florence Dealers are located from coast-to-coast and are ready to assist you from specification to final installation and everything in between. By utilizing local expertise rather than buying direct from the factory, you are guaranteed personalized local service to meet your needs for each and every project. Founded by Saulia Florence and Herbert Dix in 1934 as Florence Manufacturing Company, and incorporated as Florence Corporation in 1937, we have continually strived to meet changing market needs. As a dynamic, growing company, we acquired Auth Electric and started doing business as Auth-Florence Manufacturing in 1990. This hundred-year young company expanded our product offering to include Auth-Chimes - a quality product which has since been seen on the popular TV series such as Rescue Me, Seinfeld, and Project Runway. 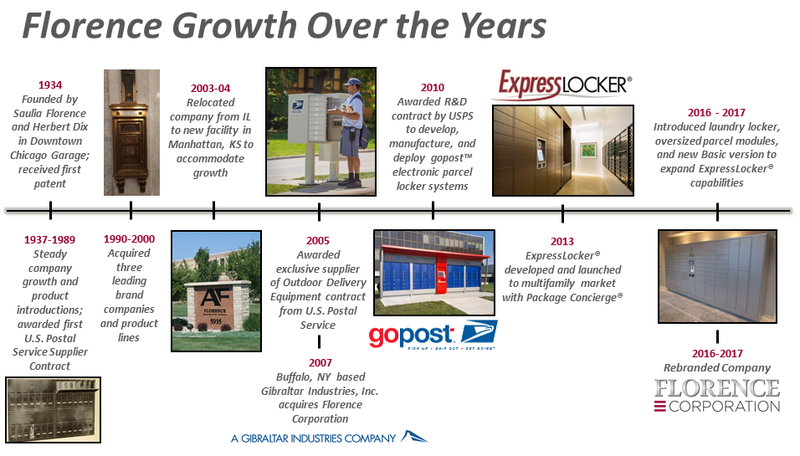 We significantly expanded our product offering once again with the acquisition of the American Device Postal Specialties line in July 1998. Two short years later, Florence Corporation acquired Cutler Manufacturing Corporation - a venerable century-old company that had manufactured postal products for the likes of the Empire State Building and the John Hancock Building. Florence continues to dedicate itself to providing secure postal specialty products built to the latest USPS standards. We are the only manufacturer authorized to supply “F” series cluster box units (CBU), outdoor parcel lockers, and replacement pedestals and parts directly to the USPS since they awarded Florence Corporation their single-source contract for outdoor delivery equipment in 2005. We are also very pleased to have been recognized by the US Postal Service for Supplier Excellence, Supplier Quality, and Supplier Innovation in six of the last 14 years and to be the first manufacturer to be officially licensed to manufacturer the CBU commercially. As the innovative value leader in providing high-quality products to secure personal property, Florence has effectively equipped commercial and residential customers alike in North America and select international markets. We continue to provide the most comprehensive line of USPS approved products in the market and are working in collaboration with teams of customers, dealers, architects and builders alike to develop additional complementary products to serve the changing needs of the market and your individual projects. In 2007, the Florence Corporation was acquired by Gibraltar Industries. GIBRALTAR is a leading manufacturer and distributor of building products, focused on residential and nonresidential repair and remodeling, as well as construction of industrial facilities and public infrastructure. The Company generates more than 80% of its sales from products that hold the #1 or #2 positions in their markets, and serves customers across the US and throughout the world from 42 facilities in 20 states, Canada, England and Germany. Gibraltar's strategy is to grow organically by expanding its product portfolio and penetration of existing customer accounts while broadening its market and geographic coverage through the acquisition of companies with leadership positions in adjacent product categories. Gibraltar's common stock (NASDAQ: ROCK) is a component of the S&P SmallCap 600 and the Russell 2000 Index. Florence Corporation is proud to power your centralized mailbox design since 1934!